THIS fox cub is struggling for his young life. His mouth is bleeding from pitiful attempts to chew through the wire noose that curbs him so cruelly. The snare around his middle has already cut through his fur and flesh. Trapped for at least 26 hours, the cub seems certain to die unless freed. But this is not the work of vandals or poachers. This casual cruelty was taking place last week on the most famous royal estate in Britain. Here on the borders of Windsor Great Park, where Prince Philip himself is Head Ranger, some of the most barbaric methods of trapping wildlife – condemned by the RSPCA – are used daily in the interests of royal sport. A Mail on Sunday investigation has uncovered an extraordinary and embarrassing anomaly which makes a mockery of the Queen’s patronage of the RSPCA. She and the Queen Mother are both vice-presidents of the society. But now the RSPCA is to hold an urgent inquiry into the snaring of animals by Crown Estates staff – and a prosecution is almost certain to follow. Evidence handed over yesterday to the society by The Mail on Sunday proves without doubt that the law is being broken on the Crown lands at Windsor. Under the 1981 Wildlife and Countryside act free-running snares, though legal, must be inspected at least once every 24 hours. It was a full 26 hours after he first found the struggling fox cub that photographer David O’Neill released the wretched animal in this picture to recover in the wild. ‘When I first found him in the woods, he was frantic with fear, snapping and snarling. I left him because I was certain the gamekeeper who set the snare would arrive at first light to put him out of his misery.’ he said. The fact that snares are being used at all is against RSPCA policy. The society’s national wildlife officer, Colin Booty, said: ‘If snares are not being checked, our officers will investigate. It is irrelevant to us that the land is owned by the Royal Family. We will act without fear or favour, and if we find the law has been broken we will not hesitate to prosecute. 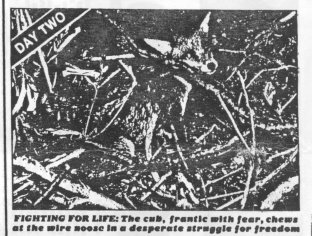 The society’s brochure on snares declares: ‘It is illegal to set snares for domestic animals, birds deer and badgers but not for rabbits and foxes. This is nonsense; if snaring is cruel to cats and dogs it cannot be less cruel to rabbits and foxes. RSPCA inspectors will visit the woods, on the Windsor Crown estates, tomorrow. The snares are set there to protect pheasants being reared by gamekeepers for the Queen’s shooting parties. Even the trees bear witness to the royal love of blood sports. On one is a plaque to mark the spot where Prince Albert ‘finished his last day’;s shooting’ on November 23, 1861. A Buckingham Palace spokesman said: ‘We are satisfied that the snares were checked every day last week by the gamekeeper and no foxes were found.’ But David O’Neill our photographer said last night: ‘I visited the woods on the Crown land on four mornings last week, each time at 4.30 am. On Tuesday the snares were empty, on Wednesday the fox cub had been caught. ‘I left the wood at 5.10 am that day. On Thursday morning I arrived to find the cub still imprisoned so I stayed until 6.45 am then released him and left.